Benjamin, Texas (coordinates 33°35′00″N 99°47′36″W) is the county seat of Knox County. Benjamin Bedford was the son of Hilory Green Bedford (1840-1927) who founded the town in the 1880s. Little is known about the town’s namesake Benjamin Bedford, other than the fact that he was killed by a lightning strike when he was about 19 years old in 1878. Hilory Bedford was born in 1840 in Kentucky. He emigrated to Texas and was a Civil War veteran, having served in Troop A of the 19th Regiment of the Texas Cavalry. Around the end of the war, he married the former Francis Elizabeth Browder. In addition to their son Benjamin, the couple had at least three more children. Hilory died in 1927 and is buried in Benjamin Cemetery along with his wife, two of his brothers, Francis Elizabeth and several others in the family. Hilory Bedford was the head of the Wichita and Brazos Stock Company, a cattle company he founded and operated with other family members. Bedford is the author of the book “Texas Indian Troubles” first published in 1905 and still widely available. The location of the town was chosen because it was situated directly between the Wichita and Brazos rivers. Bedford divided a section of land and sold home sites to people interested in settling there. In August 1884, lumber was hauled from Wichita Falls to the location to build the first 12 houses. The county was organized one year later and Benjamin was named its county seat. It was an obvious choice, since Benjamin was the only town in the county at that time. A post office was opened there in 1886 and Bedford was the first postmaster. The first settlers decided that the town would be “dry” and the sale of liquor was prohibited, but this ordinance was repealed in 1890. The Kansas City, Mexico and Orient Railroad arrived around 1900 from the north. Eventually the rail line became part of the Santa Fe Railroad. In the early days, it was the major means of transporting agricultural products like cattle, wheat and maize to market from the area. 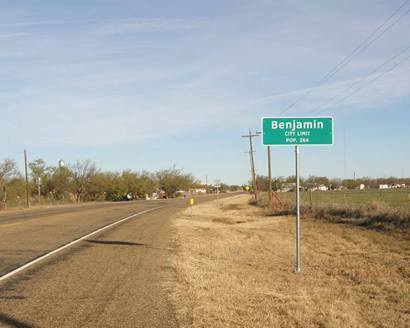 Benjamin’s largest population was in the 1930s when it reached about 700 but since then, it has hovered around 500. Its first county court house was built in 1887 but it was replaced by the current two story limestone structure in 1935. Oil was eventually discovered but since its founding, Benjamin’s residents have always primarily relied on ranching and farming for their livelihood. Thank you for a response, I had made some months ago and on some other facts, or folk lore that had come up and I made comment too, being a real Texan and researcher for the Dallas and North Texas area for several decades…..I hope my comments were not blunt, but too the fact, and that real good research requires a tem of people today to continue the message we are still intact as a Heritage with common good for all…..your recent story here, needs a better photo, an antique map or abstract,or even an artififact, and too use such in your publication would help, since we are a visual community these days, again thank you for a response and take care…Alexansder M Troup, Research Art and History…. Thank you for your comments. Most of my facts came from old newspaper articles in this case. I hope to develop better writing and documentation techniques as I get more experienced at it. The important impact is you are doing this work, as Jim Wheat did and had passed away and done pretty much the same, it is a private journalism that has too exist….it was a honor growing up too have met the people i did through my folks when they ran Troup Gallery in the 1960s and 70s on Cedars Springs, and realize.they just dont make Texans anymore after 1999…..is how I have felt, since this was a place so few trees could grow and survive the pot belly stoves of the early pioneers, who needed to cook up a meal with them trees, we Texans are far and few these days and that is observation, not bragging….take care, and please continue………. Thanks again, Al. I’m familiar with Jim Wheat and his great website. I could tell from just looking at it that he had a genuine affection for the area. Do you have a website or blog where you post? I would like to follow you, if you do. then the Love Feild Pottery works came up 2 months ago as a creek bed exposed, thousands of broken and complete pottery works from the 1920s and the Bi plane log, on pottery while the works was gone by 1947, the cast off dump site was washed out by recent rains, and the Reporter for the Morning News would not print the story since moonshine jugs were realized and the thought of Elm Thicket as a moonshine grounds in the 1920s, did not have their kind of meaning, so things just sit in boxes, even the story on why and who was the K.K.K in 1921 as bottles from the the Palace Drug store or Marvins Drugs where dug up in 1999 at the Victory site and center…. .and so the hidden history of Dallas has to remain due too the Political climate both Jim and I had too face and realize…..Leaders are dreamers who have a moment to say what they can and then move forward…..